Photograph taken at Herne Bay, Auckland,NZ. Ted Bassett and four sisters............................Back Maud and Ted Bassett. This obituary appeared in the N.Z. Herald on Saturday the 12th February 1944. The death occurred suddenly on Wednesday of Mrs Ann Jane Kidd, widow of the late Mr James Kidd, Mrs Kidd was in her 91st year. Born at Portaferry, Ireland, she was a daughter of the late Edward and Ann Bassett, who came to New Zealand in the ship Indian Empire in 1862. Mrs Kidd did not accompany her parents, remaining in Ireland with her grandparents, and coming to New Zealand seven years later in the ship True Britain. After joining her parents, who were then living at Epsom, Auckland, Mrs Kidd moved with them in 1874 to Aratapu, where they took up farming. In 1882 she married Mr James Kidd, who for some years farmed at Arapohue. Later with her husband and family she moved to Tatarariki, where she resided until the time of her death. She is survived by three sons and two daughter. 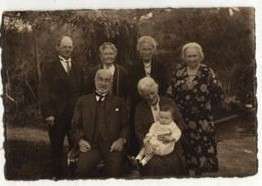 My grandmother (Annie Jane Bassett) was in deed your great grandmother's sister (Isabella Basett) both arrived in NZ on the sailing ship "The Indian Empire"
I live quite close to Ken Lendrum and his niece Christine Herald and nephew Maurice Taylor. I have had a quick look at your web site and it is certainly very extensive. 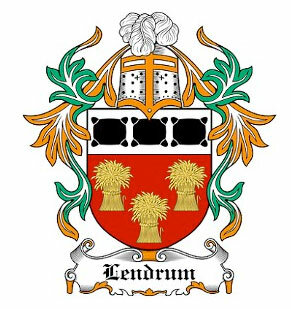 Some of the photos I have are already on the site, but I will see if I can find any Lendrum related in my collection which is quite large as I have had handed down a lot from my maiden Aunts on the Kidd side. wife runs Dahlia Haven at Silverdale and I contact them a lot as I am a keen dahlia grower. Thank you for your reply. By coincidence we know Harry Lendrum, the Bassetts and Kydds - from Dargaville, all of whom are friends and many related. When our family arrived on the Indian Empire in 1862 they were given 40 acres for each adult because they paid their own way. This land was north of Helensville and sold without being seen. John McNaughton opened a drapery business in Helensville and was a close friend of the McLeods. Our family are covered in the local book Men Came Voyaging. You will see the names of other interesting people on the passenger list, ie Warnocks - they became big soap manufacturers in Auckland, and the Massey family - who were neighbour of my gg/g'father John McNaughton. Our records show that their young son William Massey stayed behind in Edinburgh to finish education, coming to NZ a little later. William was to become the PM of NZ. Just some quick news for you.